We should be putting the “Relaunched” update to Orbitron: Revolution into Peer Review today! All being well this will be available to players within a week. Here is a list of near everything that has changed! Bloom and brightness modified to improve player ship and action clarity. Scout enemies have been re-colored so they do not blend into the background. Explosion Sound Effects changed to be more bombastic and satisfying. Player Ship Explosion more dramatic. 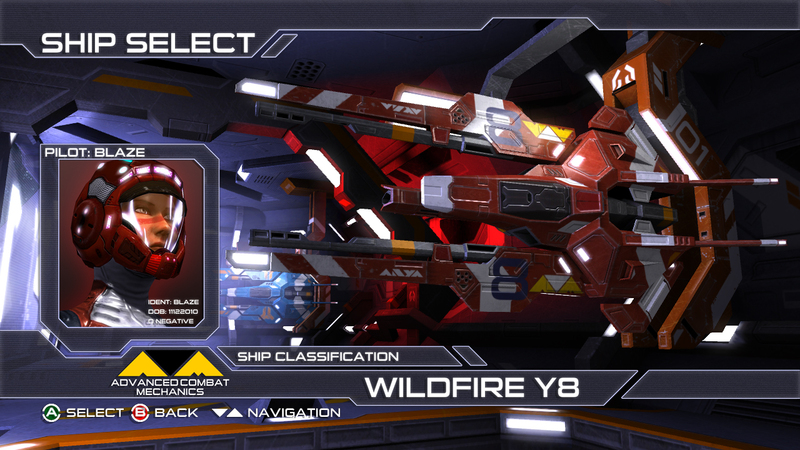 Wildfire Y8 is now the default ship in the ship Bay. Wildfire Y8 is now the controllable spaceship in the Trial. Blindfire X8 Ship has been recolored to pop out more. Lighting in the ship bay has been changed to be more animated and dramatic. Guardian Mode is now the default mode. Guardian Mode is now the game mode featured in the Trial. Time between Drillers appearing during the beginning of Guardian Mode has been lessened to remove dead time from the mode. 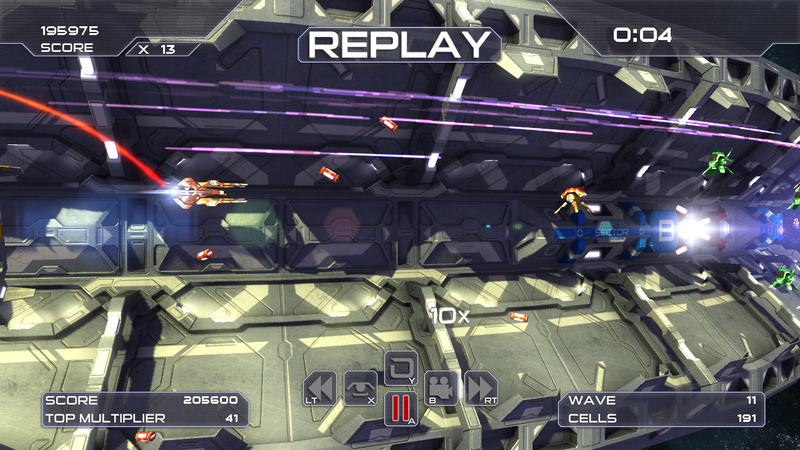 A few Drones have been added to the start of Guardian Mode to lead the player to the first Driller. Extra Mode is unlockable after only 3 minutes of Guardian Mode. The Replay Theater interface for Countdown has been completely revamped and is more user friendly. Restart and Hide UI controls in the Replay Theater are now visible to the player. Left Trigger now activates Turbo Boost as well as Right Trigger. The vertical speed of the player’s ship has been increased. The drift / momentum of the ship has been tweaked to be more responsive. Drillers are no longer invincible when spawning in. Boost Gates may not spawn on top of a player and have a bit of grace on them when they do spawn in. The cap for the number of onscreen Power Cells has been substantially increased. The Trial version starts the player with 25 power cells, up from 10 in the real game. This change only effects the Trial Version. Main Menu Orbitron: Revolution Logo centered. Game Modes, High Scores, and Options UI now smoothly scroll instead of pop. Confirmation UI added to Pause menu when the player wants to Restart, Resume, or Quit. Bug Fix: When the player is out of power cells and is holding the turbo button the power cells are no longer instantly used up. Bug Fix: When the player taps the turbo button a single power cell isn’t instantly used. Nag Screen changed to reflect game changes in this update. Power Hungry: Fill up both Power Slots. 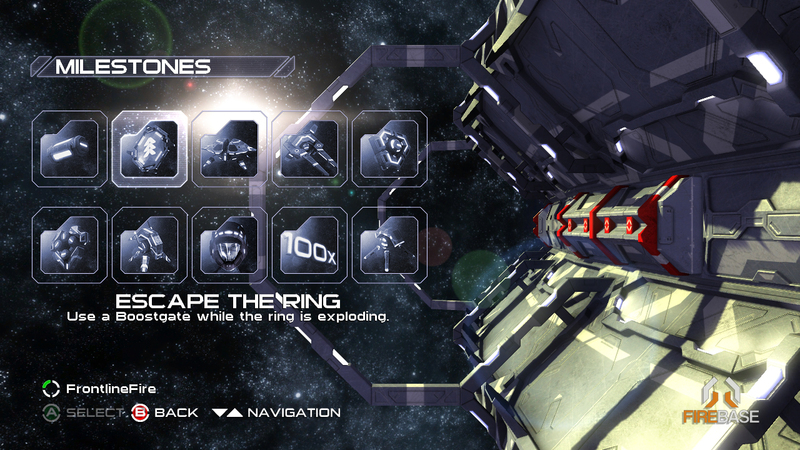 Escape the Ring: Use a Boostgate while the ring is exploding. Survivalist: Survive 3 minutes of Extra Mode. Guardian: Destroy 30 Drillers in a game of Guardian Mode. Turn and Burn: Play a full game of Countdown without dying. Wave Hello: Get to Wave 12 in Countdown Mode. Robot Collector: Don’t fire a shot in Extra Mode for 60 seconds. Ace Pilot: Destroy 10,000 robots. To the Limit: Attain 100x multiplier. Get on Board: Get a score on all three game modes. Half of these Milestones may be awarded just in the Trial Mode of the game! The “Milestones” interface. Won Milestones appear in colour. Relit Ship Bay with animating red warning light. The two ship positions have been swapped and you can see the new colour of the Blindfire X8. The new Replay Theater controls that make use of the face buttons and triggers on the control pad. More or less set up in the manner of the controller itself. Note the more vibrant recoloured Scout enemies and that there is less bloom on the environment.